In September 2012, I made my second Nullarbor crossing, this time by car along the Eyre Highway. And while it was hot, dry and dusty with a killer sand-laden wind fresh from the furnaces of hell, I couldn’t suppress the frisson of excitement that travelling this iconic landscape gave me. Because the Eyre Highway’s 1660 km length**, crossing two monster states, three time zones and the world’s largest limestone karst shelf covering 200,000 km²makes a Nullarbor crossing the ultimate Australian rite-of-passage road trip! The Nullarbor is WAY more than just a long, dusty drive from A to B. With unique Australian AND World Exclusives jostling for position amidst magnificent coastal scenery, remote roadhouses and the opportunity to be truly alone, who WOULDN’T want to experience the wonders of the treeless (Null = none; arbor = tree) plain? BUT … if you’re having trouble picturing how a Nullarbor crossing – perhaps the ultimate Australian travel adventure – is a good thing, here’s 6 trip-teaser things to see and do on the Nullarbor Plain so you can see what you’re missing!! OK, you’re on the Nullarbor on (arguably) Australia’s greatest road trip and I’m talking GOLF?? Even if – like me – you’re NOT a golfer, you’ll surely want to add a World Exclusive like World’s LONGEST golf course to your repertoire, right?? 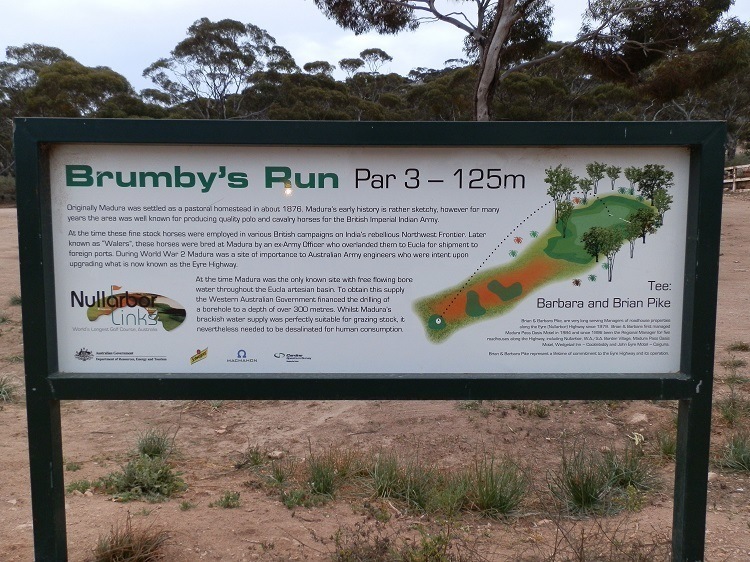 Nullarbor Links stretches 1365 km (848 miles) over 18 holes from the ‘CY O’Connor’ and ‘Golden Mile’ holes in Kalgoorlie to ‘Denial Bay’ and ‘Oyster Beds’ at Ceduna with 14 other aptly named holes – think ‘Skylab’ at Balladonia, ‘Nullarbor Nymph’ at Eucla and ‘Dingo’s Den’ at the Nullarbor Roadhouse – along the way. And you don’t have to lug a whole lot of (to me) superfluous golfing gear around either! Hire clubs at each hole!! Once across the border into South Australia, the highway skirts the Bunda cliffs with their white base of Wilson Bluff Limestone. A dramatic edge to the Great Australian Bight – that 1160 km long mouthful shaped chunk that eats into Southern Australia – the impressive 200 km of unbroken cliffs is part of the longest sea-cliff line in the world. From here, there’s NOTHING between you and Antarctica except what we Aussies call the Great Southern Ocean. To the rest of you, it’s just part of the Indian Ocean. Between May and October each year, up to 60 Southern Right Whales migrate to this area to breed and calve. One of the best places to sight them is the northernmost tip of the curve of southern coastline, imaginatively called Head of Bight! Get below the cliff line on the Great Australian Bight Marine Park’s viewing platform that puts you as close to the whales as you can get without getting wet! But don’t just drop in like we did – break your journey at the nearby Nullarbor Roadhouse so you can spend all the time you want whale watching. If whales aren’t your thing, birdwatch at the Eyre Bird Observatory – Nullarbor Quail-thrush is only found on the Nullarbor! A Nullarbor road-trip really is the best way to appreciate Australia’s size and scope as well as some experiences to be had nowhere else in Australia – or the World! During the trip, experience the longest straight stretch of road in Australia! Just how long IS 90-mile straight?? Of course … it’s 91.1 miles (or 146.6 km)!! And if you miss the bight and longest line of sea-cliffs in the world because you’re travelling by train, make up for it by riding the longest straight stretch of railway line in the world – 478 km (297 miles). Under the world record breaking limestone karst, worn by the weathering of millenia, lies the world’s longest cave system complete with rockholes and blowholes, including Koonalda Cave and Murrawijinie Caves near the Nullarbor Roadhouse. At 2.5 million acres, Rawlinna station is the biggest sheep station in the world! Yes, that makes it bigger than quite a number of countries … although the dry sheep equivalent out here is pretty low! Taking a photo of the big nothing emptiness isn’t too difficult … on roads this long, there’s not a lot of other traffic to get in the way! Perhaps because of its isolation, harsh climate and unique features, the Nullarbor’s fascinating history can be experienced along the way. Several settlements and roadhouses are built around the Telegraph line, like Eucla, near the WA/SA border, once the busiest Telegraph Station outside the capital cities when it opened in 1877. Drowning in sand, the ruins can still be accessed by 4WD. The Eyre Bird Observatory was once an historic Telegraph Station, itself on the site of a watering hole used by Edward John Eyre during his Nullarbor Crossing. Back on the highway, nearby Cocklebiddy was once an Aboriginal mission. Indigenous legend and history is further explored at the Head of Bight Interpretive Centre. If you can remember back to 1979, spare a thought for Skylab when you reach Balladonia – debris was found at Woorlba Sheep Station 40 km east. A Cultural Heritage Museum in the hotel complex also recreates the area’s history including Aboriginal Dreaming legend and Afghan Cameleers. 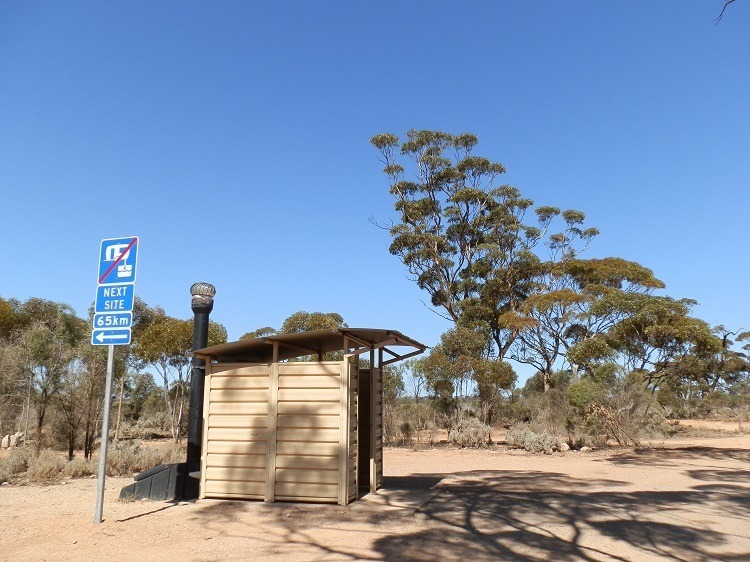 To cement YOUR place in history, pick up a Nullarbor Crossing Certificate from the Norseman Tourist Centre OR from the Port Augusta Wadlata Visitor Information Centre – depending on from which end your trip started!! The story of a blonde white woman living among kangaroos on the Nullarbor Plain was first reported, perhaps unsurprisingly on the day after Xmas, 1971. After some footage of a woman wearing kangaroo skins was released – did I mention she was half-naked?? 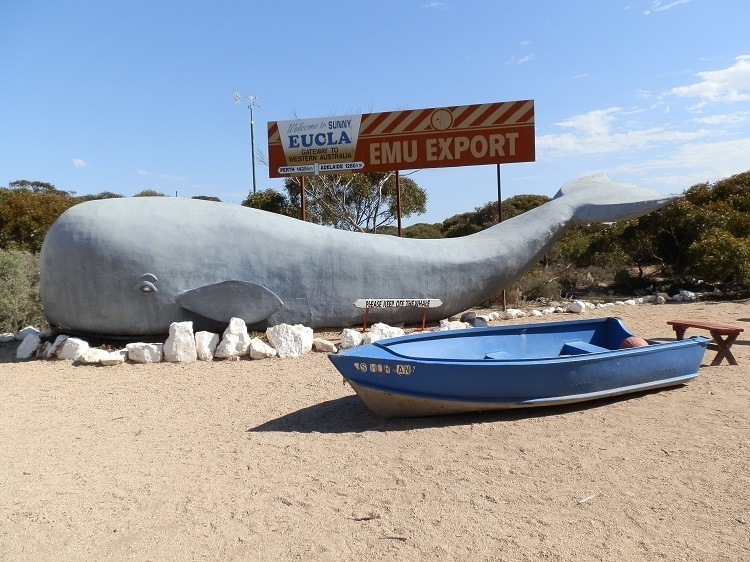 – the small town of Eucla (then with a population of 8) on the Western Australian side of the border with South Australia, was swamped by journalists from around the world. Sadly, the Nullarbor Nymph was outed as a hoax in 1972, although perhaps she remains a subliminal fantasy for in the ‘best’ Aussie tradition, the story of the nymph has been immortalised in a (you’ll not be surprised to hear low-budget) film. MORE about the Nullarbor Nymph AND more about the FILM and Kimba’s BIG Galah! Just between us, this is only the beginning … there are WAAAAY more than these 6 things to see and do on the Nullarbor! But I’ll leave finding the rest up to you!! * Famous Australian train running from Sydney to Perth ie between the Indian and Pacific oceans!! ** From Norseman, Western Australia to Port Augusta, South Australia – with the accepted limits of the Nullarbor Plain being the ~1200 km from Norseman to Ceduna. The actual distance from Perth to Adelaide is 2700 km. « 1000 Words About … Corrugated Iron! Well we’re Nullabor newbies who up till now have had ‘nowt’ thoughts about traveling this stretch by car but you’ve inspired me to think about it in a much more favourable (excited) light. Then again maybe it’s your engaging writing which had me thinking about the possibilities and discoveries to be made. Grt post ? It’s the longest – but most interesting (IMHO) – way to get from WA to the Eastern states AND still have your own car to drive in when you get there, Jo! We did the trip much more quickly than we otherwise would have because the weather was crap – next time we’ll take a bit longer and really explore! See you there?!?! It might be a long way but the nullabor certainly isn’t boring. My son did the Nullarbor Links and actually got filled by a film crew out there for some Aussie tv show they were putting together. There are plenty of free camps too along the way so you can take it in easy stages. Happy travels. I found the whole trip fascinating, Jill! I’m no golfer, but just being on the world’s biggest golf course was a thrill too – and how exciting to be part of a film about it! Next time we’ll take a LOT longer and do a few more things along the way!! I know that feeling of excitement when we sat at the start of The Nullarbor. It was so much better than I expected and the Bight and Bunda Cliffs were simply amazing. I loved every part of the crossing. Even though our Nullarbor experience was full of heat, wind and dust, we actually enjoyed it too, Kathy! There’s so much to see – even the long ‘dull’ bits are interesting because of that!! Next time we’ll take even longer, there’s quite a bit we didn’t see the first time around! Our club is planning a ride across The Nullarbor in 2017. So far we have riders from over 17 countries participating. Thanks for this valuable info and photos. After reading this we will be including a golf comp as part of the ride. Wow! I hope your club ride makes the news in 2017 Sydney Harbour Motorcycle Club – it sounds AMAZING!! So glad you found my blog post useful – I guess that means my work is done! Happy Travels!! @Alessandra – HAha, yes us Aussies LOVE our Latin!!!! Only kidding … that’s a direct result of colonialism!!! @Betty – The whales are AWESOME!!! Thanx so much for the link – hope your weekend was FAB! @Pauline – Haha, I wonder how many New Zealands would fit into that space??!! It’s SO worth doing though … glad I could inspire you! @Sallie – HAhaha, you’re SO on to me!! I featured the Big Galah later last year!!! And this was just the END of the Road trip – last year on our ‘winter’ trip we covered 16000 km! @Beach Bum – There’s a lot of this kinda signpost down here … most places are a helluva long way from most other places!!! @diane b – The Nullarbor isn’t as bad as you think if you pace yourself and don’t try to just get it over & done with! Look forward to your RED stuff – as usual, you are way ahead of me! Never been to Weipa!! @Friko – Yet people still ask me when I’m going overseas now that I’ve ‘done’ Australia!!!! @FigMince – One of the great tragedies of our crossing was not being able to give the Eyre Peninsula the respect it deserves … I look forward to giving it a good going over next time! @whiteangel – Even though our crossing was fraught with heat and wind, I would NEVER describe it as boring!!! There’s so much to see next time too!! @TFG – Yeah … forget the Rock, the Reef and the Sydney Harbour Bridge! The Nullarbor is the REAL Australia!! @Filip – That’s the problem with photos – there’s nothing to show their size! Lets just say they looked like submarines with the waves rolling over them! @Iris – HAhaha, I guess your car’s veering to the right kept you awake on the dull bits!!! AND you wouldn’t believe that just before I took the pic, there was a massive caravan parked in front of the Eucla ‘No Parking’ sign!! @eileeninmd – It’s a VERY wild & untamed part of OZ! I didn’t play the golf course, but it was a thrill to be on it, given it’s the biggest anywhere!!! @Jill – HAha, take the LOOOOOOOONG way round like we did and go home up the Centre then round the coast!!!!! There’s plenty more I didn’t write about – look forward as always to your take on it! @Mo – Haha, it’s WAY more vast when you’re actually in the middle of it!! @Andrew – Or BAD Big Things!!! The Galah is one of my personal favourites … that gives you some idea of my condition!!! @Saucy Kod – Haha, the shop was a SHOCK! Although we travelled the other way, so only saw it at the END of our journey … there are actually supplies along the way, but it’s all roadhouses and pubs! I’m with you on the Big Galah – maybe I should start producing them!!! @SFlaGuy – Anytime you want to see the world through an open window to nothing, I’m your girl!!! Living in two cities is surely akin to being on the road – but at least we tow our ‘home’ behind us!! That’s one serious roadtrip Red (and this from someone who lived on the road for years; we enjoy them!)…. You really do show us how huge your country is here. I read parts of this to Bill — wish we were younger! Have you showed us that big Gulah before? He sure looks familiar. Excellent post Red. Seriously you’re the only person who could make crossing the Nullarbor sound exciting 🙂 I do know quite a few people who have driven across and lived to tell the tale haha! I really enjoyed reading about it here, but if I had to do it, it would probably be the train for me. Crossing the Nullarbor is on my Bucket List, now I can fill in some of the details. Thanks for a great trip. aw, i’d love to see the whales and the bird observatory. i thoroughly enjoyed your article and photos. i linked to you today!! Seems you enjoy the Nullarbor as I do. The whales we saw were not large ones whoever, lovely to watch. The first thing I though is that nulla in Italian means nothing, so I had a look in wiki and found Latin: nullus, “no”, and arbor, “tree”), so Australians too go for Latin names eh! Great information. I’d never heard of the Bight or the Nymph. Love it! Item 7: Cactus Beach – big waves, long rides, white pointers. Nothing but superlatives, the whole of Australia is a superlative. How could anyone ever get to the end of this vast and fascinating continent. You have captured the essence of vastness with your descriptions and photos. I really enjoyed this virtual trip with you as I doubt we’ll ever do that trip. We have skirted the Nullarbor at both ends in WA and SA and just looking from there is awesome. I thought of you on our recent trip to FNQ. I have discovered the REDDEST place in Australia. It is at the Weipa bauxite mine. I’ll show you the proof on my blog some time in the future. Thanks for this fabulous post Red. We are crossing the Nullabor (twice – west to east, and then east to west – we have to get back home somehow!) later this year for the first time – like you said every Australian should do it at least once. Love your idea of the ABC of Australia – I will check out the rest. Always thought sign posts like that were cool! Kind of puts things in perspective. I guess you´re not even kidding about that golf-thingy! Sadly our Holden wasn´t a 4WD – and we had little time, only 6 months, sooo sad. Hmmmm, Emu Export – do I look forward to November! Missed the big Galah, too, argh. Time travel, that´d be great! We really just went through there as quick as possible back then, really sad. Red, great post on the Nullarbor with excellent photos and description. This is a journey I’d love to make some day, and will think of your highlights along the way. Wow! Your Nullarbor looks quite a bit like West Texas, and probably has similar weather. That second picture looks as though you could just drive off and never stop! So mysterious–I’ll bet you’d think all sorts of odd thoughts if you found yourself alone out there! I am not into golfing but I would like to see the whales and the bird observatory. The views of the cliffs and ocean are beautiful. Wonderful post and photos. On the picture, you wouldn’t say these whale are so big. Wow you have really captured how vast the country is. That is a whole lot of nothing. I could really go for that sometimes instead of bouncing between two cities every weekend as I do. Thank you for keeping this window on the world open for me. I look forward to the time I can look at scenes like this rather than the one behind me right now. The golf links weren’t there on our last crossing Red, so for us it is a must do when we travel over (hopefully) later this year. People say it is boring crossing the Nullabor, not so. So much to see, just different. Certainly not a place you expect to get pulled over by the police for a breath test at 10 in the morning but you can be. Just got to watch out for those road trains coming at you. Clearly it is not the longest stretch of nothing in the world. A nice post spoiled by big bad things!